I’ll admit it right off the bat: we are really lucky to know lots of people who live in cool places and do cool things and frequently invite us along for the ride. It’s now our firm policy that we say “yes!” to as many invites as possible from our loved ones. The more you pursue travel and adventure, the more you will meet other people who do these sorts of things, and the more you will get intriguing invitations sent your way. You may even be able to talk some of your friends and family who have never considered a big trip for themselves into adventuring right along with you (we’re slowly but surely becoming experts at this). 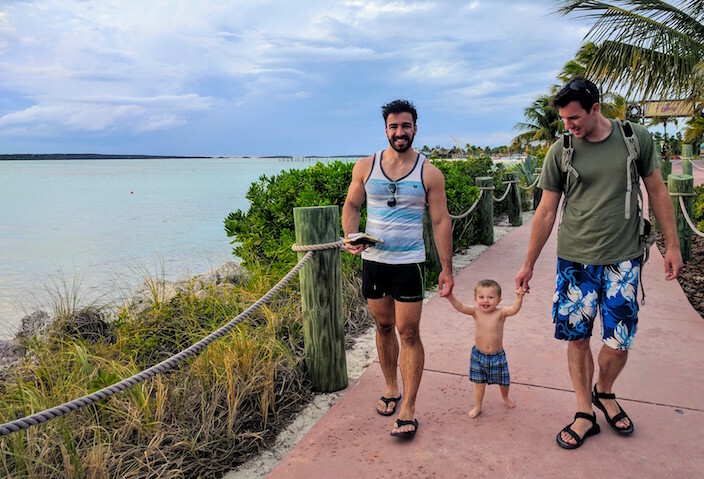 Anyway, the “yes to invites” policy led us to a fabulous and relatively cheap Thanksgiving week in Florida and the Bahamas, which was Baby J’s first international trip after over a year of passport-less lockdown. Baby J taking an oceanside stroll with his uncles. With the exception of the airfare – where we saved over $1200 – this trip involved very little travel hacking, because we drained most of our available points to pay for our upcoming trip to Switzerland over our Christmas break (we’ve saved over $12k so far on that trip alone – the complete trip report as well as our 2018 travel hacking report will be posted in January). You might be thinking “Give me a break. That’s not “relatively cheap” or any other kind of cheap.” But remember that this was for four people, for a full week of luxurious vacation during a peak travel time, and involved flying all the way across the country and then sailing right on out of the country. Not half bad, in my mind. If you don’t have the luxury of family members who want to buy nice houses in Florida and pay for your cruises (understandable), just check out the vacation rental homes available in Dunedin and Clearwater on VRBO or Air BnB – they are totally reasonable and right next to some truly gorgeous beaches (my fave is in Honeymoon Island State Park). That plus minimal effort accumulating airline miles will get you an awesome family beach trip of similar quality for a similar price – less, if you can travel in the off season! If you’re looking for bargain cruises, a college party environment, or an adults-only experience, Disney is not going to be your thing. They do have their customer service, family-friendliness (including childcare), and on-board entertainment dialed in perfectly, and as such they have no qualms about charging top dollar for their cruises. 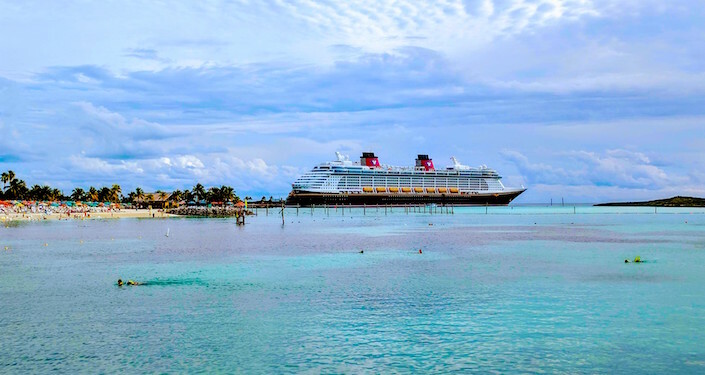 If you like Disney at all, start saving your pennies to put at least one Disney cruise on your travel resume. I would absolutely sail with them again, and I don’t even like boats. There are lots of people out there who can give you excellent advice on how to lower the cost of otherwise expensive cruises. Since this was my first cruise in over a decade – and it was gifted, not travel-hacked – I’ll defer to the experts. I recommend the free travel-hacking course at Travel Miles 101 as a great place to start. The Disney Dream docked at Castaway Cay.